Description: Rail Photo Weekend at Steamtown NHS (where yours truly served as the first park historian, 1/92-9/96), always a major hoot. The unit to the rear is RSD-17 CP 8921, "The Empress of Agincourt." Description: The F-units and a string of cabeese sit at Jim Thorpe with the famous clock tower in the background. 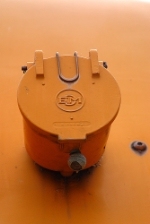 Description: The nose of a CNJ F 3 at what would become the Lehigh Gorge Scenic Railway, where, at the time, there were two used as power on their excursions. 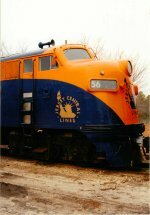 Description: These F units were repainted into the CNJ orange and blue scheme as a tribute to the heritage of the line here at Jim Thorpe. Description: CNJ F3A units 56 & 57 bring an excursion train out of the Jim Thorpe station. You can see how wide the CNJ ROW was. Description: Just like the days of past, three old workhorses rest at Jim Thorpe in preparation for the LGSR's "Railfan Weekend." Description: CNJ F3As 56 & 57 sit on a misty day in Jim Thorpe. Description: Lehigh Gorge Scenic Railway train leaves the station, passing the two CNJ F3A units. Description: While not originally from the CNJ, the ARHS and Tri State Chapter NRHS has done a good job at restoring these two F3As back to the CNJ tangerine and blue paint scheme. Description: The Antracite Railway Historical Society and the Tri State Railway Historical Society have restored these two ex-BAR F-units to CNJ tangerine and blue livery. 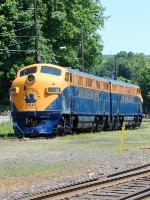 They are seen on display along the ex-CNJ mainline at Jim Thorpe. Description: Both locomotives display "56 57" in the numberboards, but this one shows 57 above the fuel tank. Description: The close proximity to a busy highway makes proper night shots tricky, so I am posting a second example with "highway assistance". Description: Thick morning fog is breaking...once upon a time, these F's could be found pulling excursion trains, but are now just on display. 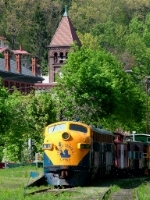 Description: Jim Thorpe has something for everyone if you can't spend all day railfanning! Description: The magnificant view from Flagstaff mountain. Description: "CNJ" F3A units. The 56 has recently had some paint work done and looks great basking in the sun. Description: "CNJ" F3A units 56 & 57 just outside the station in Jim Thorpe. Hopefully their respective owners will be able to get them running again. Description: CNJ F3A units parked just north of the CNJ Jim Thorpe station. Description: The LGSR excusion passes the CNJ F3As on the departure from the Jim Thorpe station. Description: Passing by the pair of CNJ F3s, the 425 makes her way into the Switzerland of America, known as Jim Thorpe. 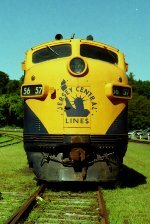 Description: ARHS' CNJ 56 is still on display at Jim Thorpe near the station.